An podgy pug ballooned to the same weight as a toddler when her former owner did not take her out for walks. She has shed about 2.2lbs (1kg) since rescuer Steve Jones took her in last summer, but has some way to go before reaching a healthy weight. 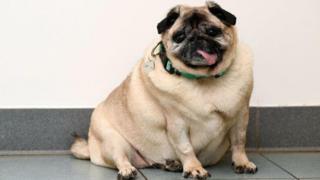 Animal charity the PDSA said obesity in pets can cause various health problems. Excess weight in flat-faced breeds such as Pugs and French Bulldogs can make it difficult for the animals to breathe, it said. Mr Jones said Sugar, who suffers with poor vision and deafness, recently had all of her teeth removed. Her previous owner was partially sighted, he said, meaning Sugar could not be walked. His other dog, a healthy Bichon Frise called Winston, is walked four times a day, but Sugar struggles to make it through just one, Mr Jones said. According to the Kennel Club, the ideal weight for a pug is between 14 and 18 lbs (6.3 and 8.1kg). About 40% of cats and dogs in the UK are overweight or obese, so here are some tips from PDSA to get your porky pets in shape. Go easy on the treats: Extra calories turn into fat, so treats should only be occasional and not part of a daily diet. For cats – little and often: Cats will eat between eight and 16 times every day, regardless of if you give them a big meal. Spread small portions throughout the day and use a puzzle-feeder to make it work for its many dinners. No human food: Certain human foods can cause tummy upsets or even poisoning. Leave the dog food to the dog. 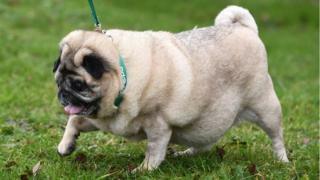 The PDSA said obesity can reduce a dog’s life expectancy by about two years and six months.